One of my favorite things to do on those rare lazy Sundays is to turn on the grill. 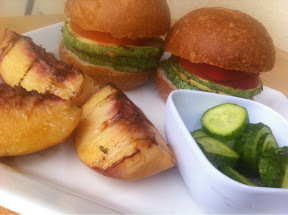 This is a super easy meal that's so filling I didn't even get to the second slider! The peach is just a white peach quartered and grilled. Choose a peach on the firmer side or it will fall apart. The peach will also take less time than the squash, so throw it on the fire about halfway through cooking the squash. The homemade pickles are also easy! Just slice a Persian cucumber into coins and pour plain rice vinegar over them. I do this before prepping and cooking. Before serving, drain the liquid off the cukes. Slice squash into discs about 1/4 inch thick. Lay flat on a plate. Spritz with Bragg's ad sprinkle with garlic powder, salt, and dried basil pieces. Flip squash over and repeat. Spray grill with cooking spray. Turn on to medium-high heat. Lay squash slices on grill and cook for about 8-10 minutes flipping once. Keep an eye on them because cooking time will vary with the heat of the grill and your desired doneness. While squash is cooking, slice tomato into thin slices. Slice rolls in half and layer one half with tomatoes. Add cooked squash and serve. If you are counting points on WW, the only points will come from the rolls you choose. I could def use some of those as i nurse this hangover.